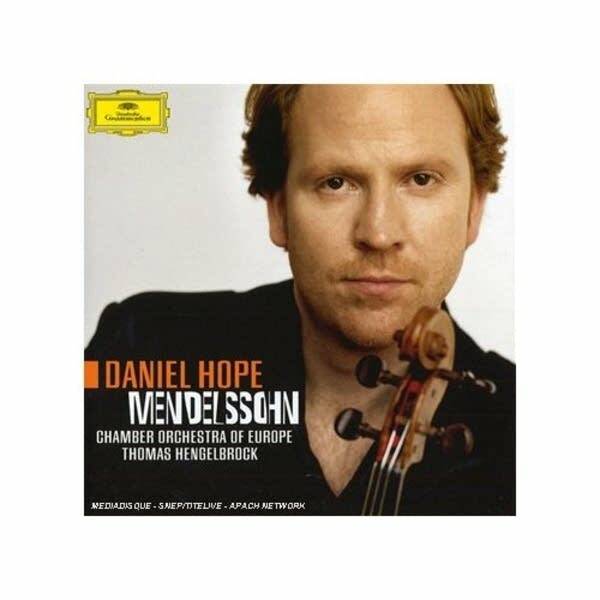 When Daniel Hope was an 8-year-old violin student at the Menuhin School in England, the Mendelssohn Violin Concerto was forbidden fruit -- not to be approached until the teachers said you were ready. Daniel desperately wanted to learn it, so he secretly borrowed the score. Practicing the Mendelssohn concerto without permission was a serious matter. When he got caught he was marched down to the director's office. Despite that rough start, or maybe because of it, this work has been Hope's constant companion ever since. It's the first concerto he heard performed live, the first one he ever learned, and the one with which he made his debut at age 15. On his new release, Hope delves even deeper into this concerto by presenting the world premiere recording of Mendelssohn's original score. This concerto is one of the most popular ever written for the violin, but this version is one you may never have heard. Mendelssohn spent seven years tinkering on the original before it was completed in 1844. Even after he sent it to the publisher, he continued to make up to 100 changes with the help of violinist Ferdinand David, who later premiered the work. If you're familiar with the well-known revised version, several passages on this recording may be surprising, especially where Mendelssohn transposed the solo line up or down an octave. The cadenza in the original 1844 version is more mysterious, and less flamboyant. The tempo of the first movement is also given a different marking. The revised version calls for "allegro molto appassionato," which means lively and with great passion. The original version heard on this recording is actually "Allegro con fuoco," lively, with fire. Daniel Hope and the Chamber Orchestra of Europe blaze their way through this movement, shifting quickly through hairpin crescendos and diminuendos. Hope plays with conviction, determined to win over anyone who might think this original version pales by comparison. In the slow movement of the original version, parts of the violin solo line are an octave lower, and the dynamics are much softer than the revised version. Daniel Hope plays delicately with a tender, lyrical touch. At times, this lovely andante sounds like a lullaby. Daniel Hope has written a book to coincide with the release of this new recording. It explores his own German roots. There is a connection to Mendelssohn in his family tree. Hope is a direct descendant of Carl Friedrich Zelter, who was Mendelssohn's teacher. It was Zelter who supervised the composition of Mendelssohn's groundbreaking Octet, written when the composer was just 16 years old. On this new release, Daniel Hope has recorded for the first time the recently published revised edition of the Octet. Recording this work with members of the Chamber Orchestra of Europe was a real thrill for Hope. He loves their sense of energy, which comes through vividly in this performance. Three small musical confections close out this recording -- Hope's original arrangements for violin and piano of three of Mendelssohn's lieder. "Suleika" was a favorite of Hope's great-great-grandfather. It's based on a poem by Goethe, whom both Mendelssohn and Daniel Hope's great-great-grandfather knew well. That intimate connection comes through in Hope's poetic performance. "You never know what the brilliant young British violinist will do next," the New York Times once said of Daniel Hope. A search for an alternative view is all part of the creative process, Hope explains. On his new release, Daniel Hope's search resulted in two world premieres, and three original arrangements of works by Mendelssohn that any music lover will welcome with open ears.